The media’s coverage of the death of Osama bin Laden this past week provided a historic case in duplicity and disingenuousness by both commission and omission. All was rosy as far as the media was concerned, even though there were many elements to Osama’s demise that begged additional scrutiny by the fourth estate. We seriously must assess what those values are, since so much of what led to Osama’s death presents an ethical conundrum of significant proportions. The media displayed little scrutiny of what exactly those values are. For example, the information leading to the identification of Osama’s “most trusted courier,” was derived by the use of “harsh interrogation techniques” on Khalid Sheikh Mohammed by the CIA. As if that wasn’t enough, the CIA confirmed and garnered additional intelligence on the identity of the trusted courier by waterboarding (aka “harsh interrogation technique”) Mohammed’s assistant, Abu Faraj al-Libbi. Collectively this intelligence led our counterterrorism experts to the courier, who in turn eventually led to the location of bin Laden. I still haven’t heard Attorney General Eric Holder announce that he was dropping his investigation into CIA operatives who conducted the waterboarding. I’m sure there’s a value embedded into that reticence. Those harsh interrogation techniques were so demonized by the press when it was learned that George W. Bush authorized them, you’d have thought the nation had lost its soul for resorting to such measures. Yet it would appear that if such questionable intelligence lends itself to gloating over the media’s darling, such Machiavellian “ends justify the means” is condonable. As columnist Victor Davis Hanson wrote this week, “It seems okay to assassinate a terrorist kingpin either by air attack or commando raid. But legal and moral problems arise if he is captured, detained, waterboarded, or tried in a military tribunal. A quick death seems to end almost all legal discussions and controversies.” That seems to clarify some of those “values that make us who we are,” doesn’t it? A fundamental value that we Americans treasure relative to our judicial system is that those accused of crimes are innocent until proven guilty. Even if someone admits or confesses to a crime, that confession is only valid and usable in a court of law if the accused has been read their Miranda rights. I guess I missed the reporting of Osama being Mirandized. And typically the death penalty is decried by the media as inhumane and uncivil, yet apparently in this case it was acceptable. If a policeman shoots an unarmed man, he is ignominiously discharged from service and brought up on charges of murder. Osama was not armed at the time of his death. I guess it’s okay under certain circumstances. And how about that issue of shooting him again just to make sure he was dead? That sounds like something that cowboy George W. Bush would authorize. I don’t think we do that even when we inflict capital punishment. We don’t gas them or electrocute them again just to make sure they’re dead. So thus far we have, by Obama’s own admission, the president not just giving the order to not bring Osama to justice, as has been said so many times, but declaring himself to be the arresting officer, the judge, the jury, and the executioner, all done on foreign soil over the protestation of the Pakistani people. Is this new precedent, or am I missing something about what exactly the values are that “make us who we are?” The media seems to have no problem with all of this as long as it’s done by their guy in the White House. Why do I have this sneaking suspicion that there would be a bit more scrutiny if all this had been done on W’s watch? And just for good measure, the President also authorized himself to be the funeral-home director, by directing the military to dispose of Osama’s corpse at sea. I guess being commander-in-chief has some perks that I wasn’t aware of, including corpse disposal without input from family members. In his Sunday speech, Obama referred to himself over 25 times as if he did it all. Certainly the media would have mocked W as being narcissistic if he had given a similar speech of self-adulation. Not only are we left to wonder what Obama’s values were being referred to when he said they “make us who we are,” but again we’re left marveling at the dearth of scrutiny and criticalness by the media. 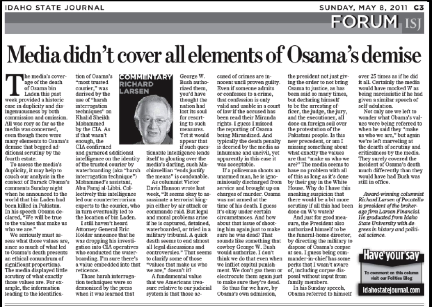 They surely covered the incident of Osama’s death much differently than they would have had Bush was still in office.